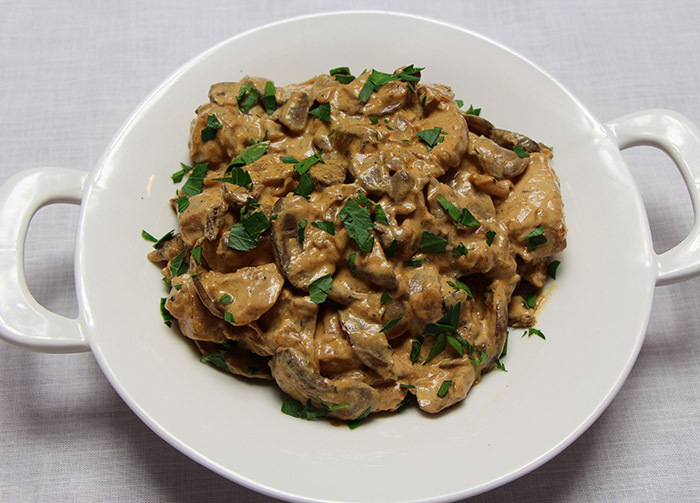 This velvet chicken recipe got its beginnings as a beef stroganoff recipe given to me by my Mom…I decided that I would add some brandy and chicken thighs to it and this is the result. A luxurious weeknight dish that tastes like it took hours to make! Don’t be shy with the lemon and the salt at the end of the cooking-the sauce can really stand up to a strong hand with the seasoning. Heat a large skillet over a medium high heat. Add 2 tablespoons of butter. Once the foaming subsides add the onions, mushrooms, 2 generous pinches of salt and a couple of grinds of pepper and cook, stirring occasionally, until the vegetable have given up their moisture and start to become golden brown, about 10-15 minutes. While the vegetables are cooking heat another skillet over a medium high heat and add the remaining butter. Once the butter has stop foaming, add the chicken to the skillet and season with a couple of pinches of salt and ground pepper. Cook the chicken, stirring occasionally, until slightly browned and almost cooked through, about 7-8 minutes. Once the vegetables are cooked add the brandy and cook until the vegetables are almost dry, about 3 minutes. Lower the heat to medium and add the sour cream, cooked chicken and paprika. Stir well to combine and cook over a medium high heat, stirring frequently, until the chicken is cooked through and the sauce has thickened slightly, about 5 minutes. Stir in the juice from half of the lemon, taste and adjust seasoning with lemon, salt and pepper if needed. Sprinkle the chopped parsley. This dish is really fantastic over some rice too!